The Town of Walkersville’s Burgess, Commissioners and Planning Commission will meet for a joint workshop on Tuesday, November 24, 2015 at 7:30 p.m. in Walkersville Town Hall. The sole purpose of the joint meeting will be to discuss a request from developers of a farm on Biggs Ford Road between Glade Creek and Kenneth Drive. The developers of the proposed Parkside Development have requested waivers to the Walkersville Design Manual. The developers request a modification from the closed section roadway requirement. 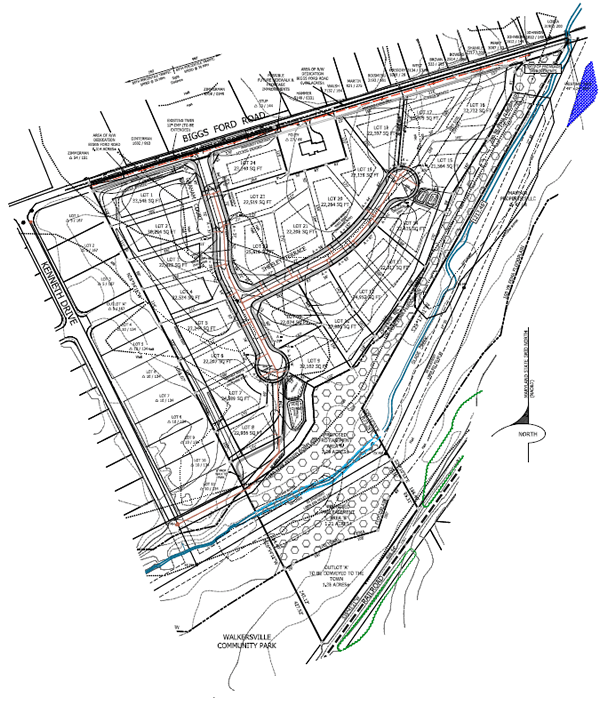 They seek permission to be allowed an open section (non-curbed) roadway along the proposed widening of Biggs Ford Road between Kenneth Drive and the entrance to their development. They claim that Biggs Ford Road will pond more water during storms with a curbed roadway. The developers point to the amount of drainage coming from the property across the street. One of the neighbors has requested relief from the flooding and contacted both the Town of Walkersville and Frederick County to address the issue. The Planning Commission requested more information, and any waiver requires approval of the Burgess and Town Commissioners. They have chosen to meet together to gather more information from both the developers and the town’s engineering firm.